Bohin Tapestry Needles, size 24  - $2.72 : Yarn Tree, Your wholesale source for cross stitch supplies. Item 7115. 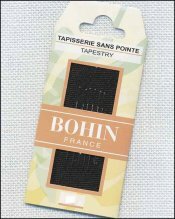 Bohin tapestry needles size 24. Sold by the card; 6 needles per card. Please order by number of cards. 1 7/16" long. Blunt point tapestry needles for cross stitch, hardanger, blackwork, needlepoint and other needlework from Bohin France. Exceptionally smooth, high quality needles. Nickel plated steel. 6 needles per card; 10 cards per pack. Please order by the number of cards.